Mastertronic was infamous in the magazine world for not advertising. But the price we paid was reduced editorial coverage. Sales Director Alan Sharam believed that the charts were rigged. The chart reproduced here had no real meaning other than to show what we were currently trying to sell. The inclusion of a few Sega Master System games is a pointer to the future. This was published in Popular Computing Weekly 17 December 1987, aimed of course at the retailers stocking up for Christmas (and for the hoped-for boom in January when the kids rushed out to buy stuff for their shiny new machines). There are also a few Amiga titles but nothing for other 16-bit machine. 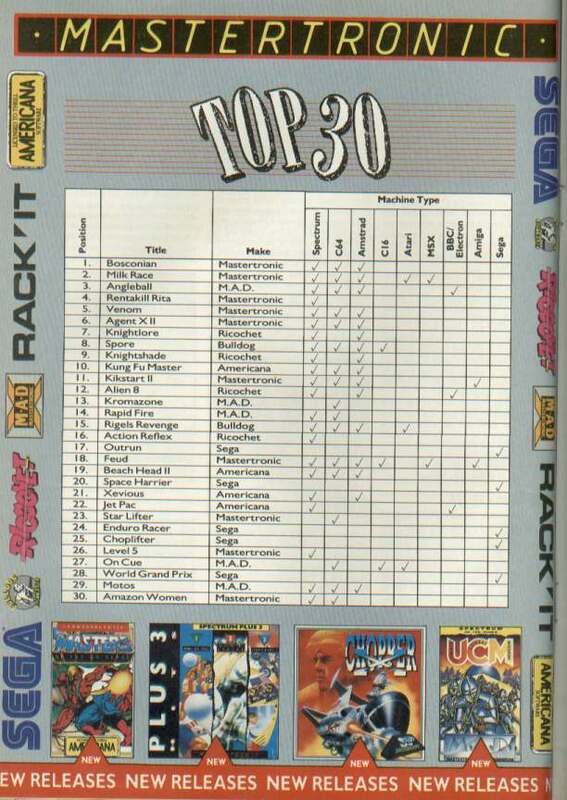 It is also odd to see Sega cartridges, which were a lot more expensive than tape based software, in the list but no Melbourne House or Virgin titles.